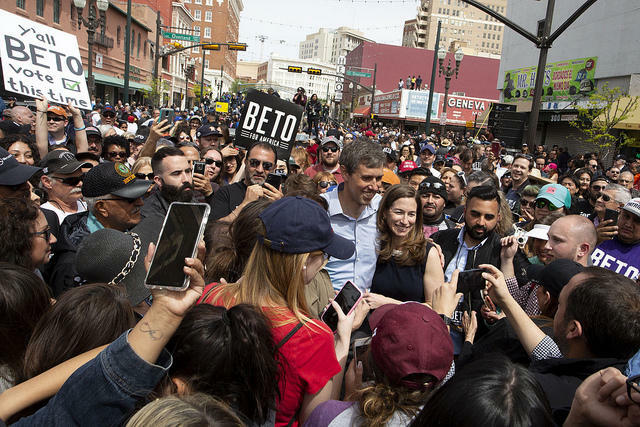 Beto O'Rourke addresses thousands of supporters at his campaign kick-off rally in El Paso on Saturday. "We are safe because we are a city of immigrants and asylum seekers," he said. "We have learned not to fear our differences, but to respect and embrace them." O'Rourke called the challenges facing the country the "greatest of our lifetime" and noted the economy works too well for too few and not at all for others. He slammed PACS and special interest groups and said when they can "buy the outcomes of elections and legislation … we run the risk of becoming a democracy in name only." Among other topics during his half-hour speech, he touched on universal health care, climate change, teacher pay, paid family leave, decriminalizing marijuana possession, confronting the legacy of slavery and segregation, and freeing Dreamers from the fear of deportation. He said immigrants being detained at the border are "fellow human beings and deserve to be treated like fellow human beings," and that he would work to develop comprehensive immigration reform. O'Rourke noted that President Trump uses race, ethnicity and religion to make people afraid of one another. "We will not allow ourselves to be defined by our fears or our differences," he said. 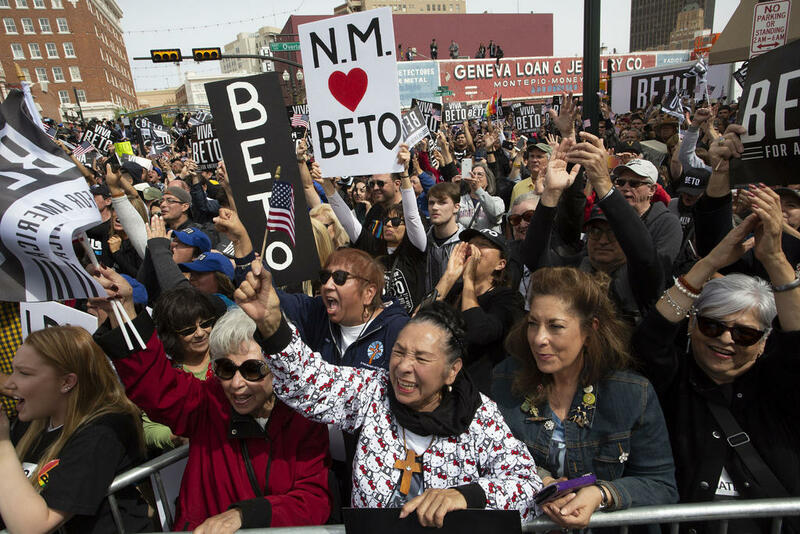 Supporters cheer for the Democratic candidate at the Beto For America rally. O'Rourke told veterans he would invest in the VA and ensure all returning service members had a roof over their heads. He said he would make sure the country did not start another war without first exhausting every peaceful, diplomatic avenue. He said the country needed to reassert its role on the world stage and "end love affairs with dictators and strongmen." One of his firmer promises concerned voting: “As president, I will sign into law a new voting rights act.” He told the crowd he would eliminate gerrymandering and create nationwide same-day and automatic voter-registration laws. He said "the power of people" was what was necessary to accomplish these priorities. O'Rourke and his wife, Amy, greet supporters in the crowd. O'Rourke was preceded onstage by his wife, Amy; DACA recipient Mariel Cheda; and El Paso Congresswoman Veronica Escobar. Escobar kicked off the event by welcoming the crowd to the "safe and secure U.S.-Mexico border." From El Paso, he headed to Houston for a rally and then wrapped up in Austin at an event near the Capitol. O'Rourke addresses the crowd at a rally near the Capitol on Saturday. O'Rourke, who narrowly lost his challenge to Sen. Ted Cruz in November, announced he was seeking the Democratic presidential nomination in a video with his wife posted March 1. He joined more than a dozen major candidates vying for the nomination. The first presidential-nominating contests are about a year away. And Democratic primary voters, in particular, have a growing field of diverse candidates to choose from. So far, the field includes six women and five people of color. While talking to voters in Iowa this month, O’Rourke acknowledged he has an advantage running as a white man. During a taping for a political podcast, he said the U.S. has “a long way to go” when it comes to opportunities for women. He said he plans to do what he can to change that. “There is much more that I can do,” he said. 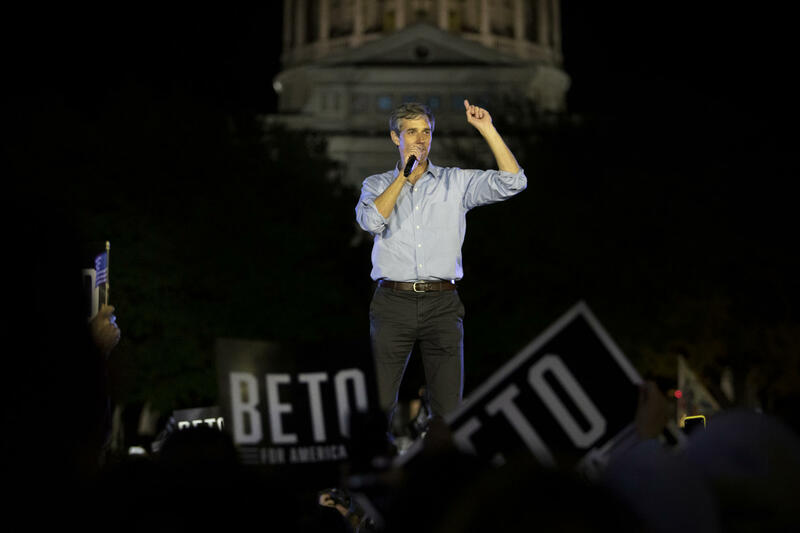 Shortly after his video announcement earlier this month, O’Rourke traveled to Iowa, Wisconsin, Michigan, Ohio, Pennsylvania, New Hampshire, South Carolina and Nevada. Over a 10-day period, O’Rourke introduced himself to voters in those states. He told reporters he expects it will take time for him to earn votes in Iowa and elsewhere – mostly because voters have so many options this year. O’Rourke’s campaign announced it had raised $6.1 million in the 24 hours following his announcement – more in the first day than Bernie Sanders and every other Democratic candidate who has disclosed figures.